BOCA RATON, Fla. -- No idea was left untouched Tuesday as the League's general managers continued their efforts to make the game safer at annual meetings here. In fact, the general managers even discussed modifying portions of the rules package instituted six years ago to offset significant obstruction that had crept into the game. In the end, though, there was little enthusiasm for compromising the speed of the sport. Instead, the GMs are suggesting stricter enforcement of existing boarding and checking rules. Plus, there has been a recommendation for more substantial supplemental discipline in regard to dangerous hits. Expect the GMs to propose a plan Wednesday morning before these meetings adjourn. Those GMs that proposed to slow the game down argued that players are being hit harder and more often because players -- especially forecheckers -- are allowed more rapid transit through the neutral zone and into the attacking zone because of the suite of rules that abolished obstruction and allowed the two-line pass to return to the game after an extended absence. That argument was countered eloquently by others. "I recall the first two years coming out of the lockout, people were calling the NHL the No-Hit League," said Brendan Shanahan, the League's Vice President of Hockey and Business Development. Shanahan played through the obstruction-heavy late '90s and finished his career, in 2009, in a game virtually free of unpenalized obstruction. Therefore, he is among those players uniquely qualified to discuss the topic. "The solution for player safety is not to go backward," Shanahan said. "Then we're just chasing our tails. So, let's start obstructing again. 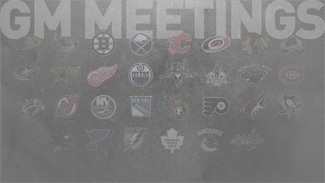 In five years we'll have another one of these meetings and talk about unlocking the game." Rob Blake, now a manager in the NHL's Hockey Operations Department, also played on both sides of the obstruction divide. He said he believes that it is the speed of the players -- obtained through advanced training methods -- and not the speed of the game that is contributing to many of the dangerous hits presently in the game, especially those along the side boards and behind the nets. "The guys are bigger, they're stronger, they're faster," Blake said. "Because of that, and because of some of the changes to the game post-lockout, that speed has increased in situations along the boards that we don't like and we want to look at. Charging and boarding calls will be under the scope right now to see if they need to be tightened up." Many of the general managers agree with what the recently retired players had to say on the subject. "There was some discussion of that but I think there was a sense more the speed we brought to the game has added an element of danger because of the speed of the players," Toronto GM Brian Burke said. "I think our focus is to see what these changes, these tweaks do, what this heightened enforcement does before we start monkeying with putting the red line back in or taking out the trapezoid." But, as Shanahan was quick to point out, the discussion about slowing the game down is not a bad one to have. In fact, he argued that any discussions about the state of the game are important -- even if they don't lead to tangible results. "It's healthy," Shanahan said. "Every few years we have to re-evaluate the game, make tweaks and adjustments. The coaches and players, the game will never stop evolving."